The first signs of spring were here. From her bedroom window, Michelle had watched the giant icicle on the forest-facing side of the house become smaller and smaller as it dripped from the eaves. Sometimes she would open the window and reach out and grasp the freezing wedge between her hands, rubbing the droplets off as if to hurry the process. She liked the cold ache it left on her hands. Her younger sister Sarah was right behind her, as usual, spying on her. Well, to be fair, it was her room too. But life wasn’t fair, as her father was always telling her. Michelle picked up a sneaker and chucked it at her sister. Sarah ducked and stuck out her tongue. Michelle slammed the window shut and chased Sarah out of the room and down the stairs. Michelle rolled her eyes. She didn’t play anymore. Not with her baby sister, anyway. She hurriedly put on her coat and rushed out. “Don’t follow me,” she muttered through the closing door. Michelle skipped down the concrete steps toward the tulip tree. 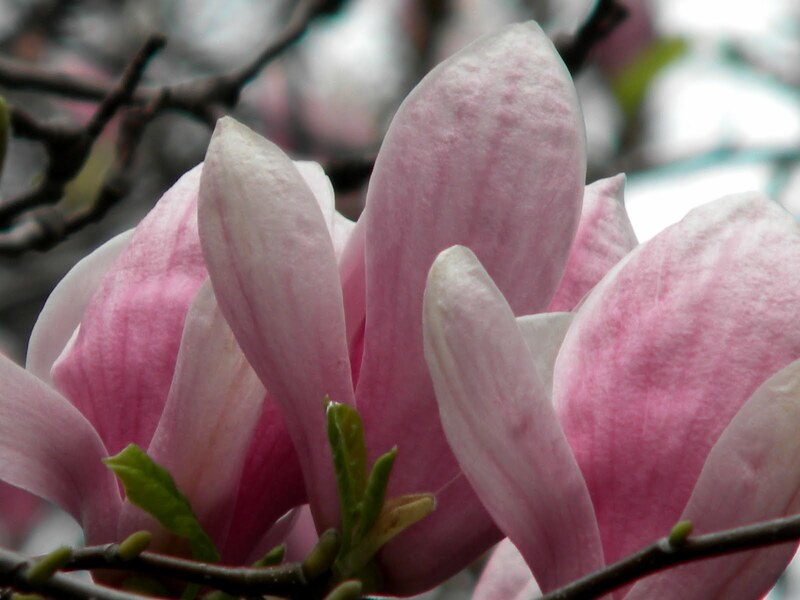 Its scientific name was magnolia soulangeana, which seemed fitting. This tree definitely had a soul. She knew she would find the tiny buds beginning to break open. She had been watching for them for weeks. She stood under the tree and looked up through the studded branches. The sun poured down onto the little velvet casings as if to cheer them on. The tulip tree always had a distinct smell that changed throughout the spring and summer. The buds had a tight, tart smell — like the very brief and distant becoming of something that would soon begin to open and sweeten. Michelle ran her fingers along one of the buds and felt the soft bristles of the shell. Inside it was growing its own version of a pearl — a gloriously layered gem of pinks and whites and purples that would open again and again to reveal deeper shades and smells. Every year these flowers became a portal to another world — to a magical place where faeries fluttered in tulip dresses, where flowers of every kind bloomed, where sugar waterfalls glistened. Winter was not allowed in this place, for the wicked Snow Witch had been banished by the Queen Faerie. 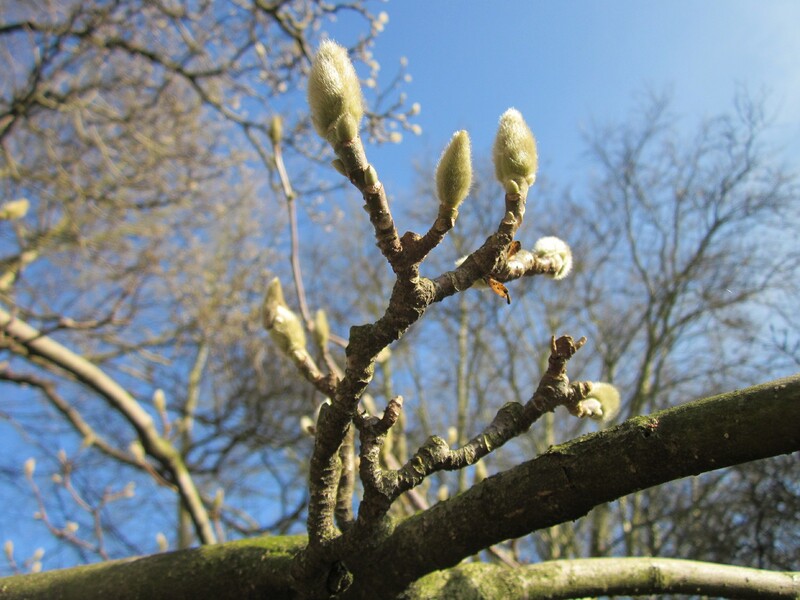 Once the buds began to sprout and crack open, all of the darkness and cold of winter with its dreary days and vacuous nights would be crushed. At least for a season. Michelle whirled around to see her sister coming down the stairs. Sigh. She could never escape reality for long. “Mom made me come out.” Sarah grumbled past and headed for the swingset, her puffy blue coat swishing as she swung her arms with purpose. Michelle reached up and plucked a bud from overhead. She rolled it between her hands and felt the tiny ridge of the bloom beginning to emerge. She held it up to her ear and could almost hear the whirring of waterfalls and faerie wings. “What are you doing?” Sarah asked. Michelle glared over at her sister and then looked back at the bud. Sarah picked up the bud that had bounced off her jacket. She brought it close to her face. Sarah stared at the bud, uncertain. Michelle sat down on the swing next to her and grabbed it. She held it in one hand and used the thumbnail of the other to gently pry away the green velvet skin. It was hard and crunchy. Inside it was a deeper green with dark purple streaks. It smelled richly bitter. Sarah scrunched up her nose and sniffed. “It’s a magic egg,” Michelle suddenly whispered. She covered it with her mitten. Michelle shoved Sarah’s swing and made her slam against the side bar. “Ow!” Sarah rubbed her arm but kept her eyes on the bud. She held open her palm and they gazed at the dark oval resting there like a chrysalis. Michelle hopped up. She heard the clink of Sarah’s swing as she followed her. “How about a stone?” Sarah handed her a long, thin slab of stone from the side of the garage. “Where should we bury it?” Sarah asked as she wandered about the yard. They bent over the ground. Sarah used her mitten to wipe away the damp clump of leaves. Michelle used the stone to bore a small hole in the wet earth. She placed the tiny bud inside. The girls carefully covered the hole and placed the stone slab on top as a marker. They stood and looked down at the sacred site. Then they looked over at the tulip tree. “We could make a lot of faeries,” Sarah breathed. As they raced to the porch, Michelle wondered how she was going to pull this off. Maybe her older sister Lisa would have an idea, if she could catch her in a decent mood.